Melvilliana: Cortez at Vera Cruz and Caesar's burning boats in "The Enthusiast"
yet will I trust in Him." The point of the historical analogy is absolutely clear: imitate Caesar if you have to and burn your boats, rather than conform over time to the lying material world and its values. Caesar's boats are whatever binds one to worldliness, whatever one regards as the most appealing temptations to follow the corrupt crowd. The heroic seeker of truth and light should keep true to the dreams of youth and resist corrupting influences. Burn the fleet! No turning back for Melville's self-consciously aging enthusiast speaker. "because Achillas (one of the assassins of Pompey) escaped, Caesar was forced to burn his own ships in the harbor at Alexandria 'to prevent their falling into the enemy's hands.'" In Plutarch's account Caesar "was forced to burn himself" his own ships, "and the flames unfortunately spreading from the dock to the palace, burnt the great Alexandrian library." Terrible! The terrible destruction of the glorious library at Alexandria is the really significant event, surely. As for the action of burning his ships, that was something Caesar was forced into doing--nothing especially noble or heroic about that. It seems a feeble example of noble enthusiasm. Furthermore, in this particular case the sense of "no return" does not apply. Caesar did not burn his ships in order to prevent return, but to prevent attack. Caesar's hugely famous "point of no return" moment was, of course, his Crossing the Rubicon. Melville compared his hero to Caesar using the Rubicon analogy in a chapter of Pierre. The great instructive example of burning boats is not Caesar but Hernán Cortés. Update: Examining the legend and its historical and literary significance, Winston A. Reynolds confirms, "Cortés did not burn his ships, although it is true that he destroyed them." Nevertheless, even now in this enlightened twenty-first century, "burn the ships" or fleet or something to the effect of burning one's boats is a proverb of brilliant business strategy and life wisdom. In contrast to the bad example of Caesar, the story of Cortés at Veracruz supplies exactly the right parallel to the enthusiast's urge of "no return" in Melville's poem. Perhaps Melville misremembered the story of Cortés and confused or fused it in "The Enthusiast" with Caesar's "no return" moment of crossing the Rubicon. As shown here, the connection is easy to make. 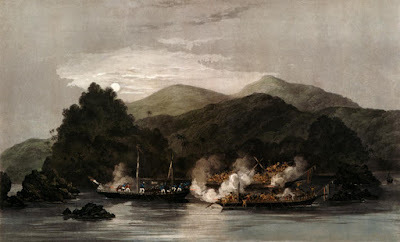 “ The more we consider and reflect upon the strokes of our hero’s policy, the more we must be persuaded he deserves that title, since nothing could be greater in itself, or performed with more spirit and resolution, than his scheme of burning his ships, which he knew must fill his soldiers with a determined resolution to conquer, since it absolutely took away what had hitherto damped and qualified that ardour, the hopes of getting back to Cuba, and escaping perpetual labours by a timely, but less honourable retreat.”—Voyage of F. Cortes—Harris’s Collection, Vol. 2. The Spanish fleet takes fire.— Cortez snatches his standard from the Officer who bears it. Cor. Castilians—Retreat is impossible!—The enemy is before you! [Pointing to the standard] Let us follow the Cross, for under this sign we shall conquer! Chorus—Spaniards and Mexicans. ALVARADO, CHRISTOVAL, FRANCISCO, SANDOVAL, and Spaniards, exultingly. To glorious death or victory! During this chorus the ships burn and sink, and the crews are seen rowing in boats for the shore by the light of the conflagration. --Cortez; or, the Conquest of Mexico. Yes, the story of Cortés perfectly captures both the sense and spirit of Melville's poem "The Enthusiast." The enthusiastic Queequeg "with one backward dash of his foot capsized and sank his canoe" as well, when he sought to gain a passage to Christian lands (M-D, Chapter 12). Hi, what is the name of the painting and the artist? Great question, thank you! Defeat of the Spanish Armada, 8 August 1588 by Philip James de Loutherbourg (1796). Not the burning ships of Hernán Cortés, sorry. Updated today with a newer version of the image on Wikimedia Commons.